This page provides a link to virtual rhinoplasty software. Visualize surgery results easily and privately using the same technology that surgeons use. Preparation is the key to a successful cosmetic surgery procedure. If you’re considering a nose job or rhinoplasty, then you may find it beneficial to upload your photo to a nose job simulation program such as FaceTouchUp. With this software, you can reshape parts of your nose to experiment and see what your ideal nose may look like. The works best for cases where you need to change your nose’s side profile, or narrow your nose’s front profile. Once you’re done reshaping your nose, you can send the before / after photos to your surgeon to discuss the possibilities. Here’s the steps to do both. At the end, you can try the program yourself using your own photos. If you have any feedback or need any assistance, please feel free to contact us. This software is not intended to provide or replace a thorough medical consultation. It is only to be used for informational purposes. The included virtual plastic surgery program is to be used for illustrative purposes only. The results of actual surgery will vary. If you are considering plastic surgery, please consult a qualified surgeon. The decision to have nose job surgery is not an easy one to make. 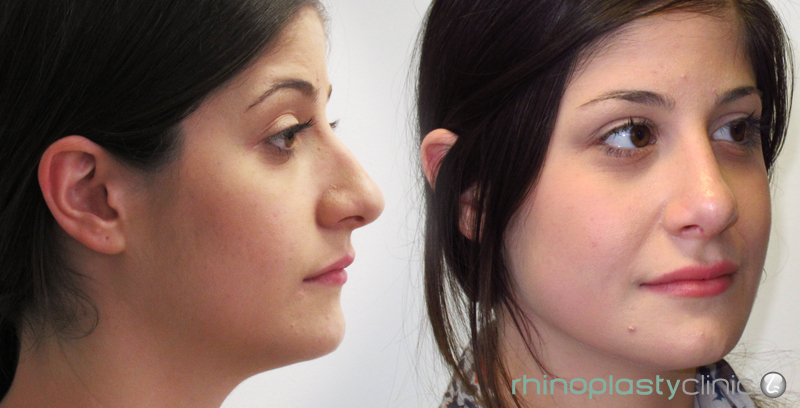 A common way for people to get started is to review before and after rhinoplasty pictures. This will give you an idea of what changes are possible. Many patients of rhinoplasty surgeons seek treatment because they believe that their nose is out of proportion with their face. Alterations such as increasing or decreasing the size of the nose can be accomplished by an experienced surgeon. The shape of the nose must also be considered, both for functional and aesthetic reasons. It is important that the nose fits in naturally with the patient’s face while ensuring that proper breathing is maintained. When searching for nose job before and after photos, you may also find pictures of people who had cleft deformities that were corrected through cleft lip rhinoplasty. Some individuals choose nose job surgery because their noses have grown in size due to the normal aging process. Others choose this form of surgery because they experience ear, nose and throat disorders caused by a malformed nose. Whatever the reason for rhinoplasty surgery, viewing before and after pictures are also a great way to check into the experience of a surgeon. These pictures may be considered their portfolio in a sense. While pictures can be helpful, it is important to use other factors in order to determine whether or not this procedure is right for you and in order to find an experienced surgeon if you do choose to undergo nose job surgery. The price of a nose job, whether you are ready to deal with the recovery process, and other factors will help you to make your decision. It is also important to carefully assess a surgeon’s experience and to set up a consultation where you can talk about any concerns you may have.